Posted on November 14, 2018 by Betsy Jacoby-Greenleaf. Dealing with labor unions at trade shows is as ubiquitous as fortune cookies are with Chinese take-out. Just as you can anticipate reading a new fortune with your order, you should always anticipate and plan for a union presence at your show. Having to deal with unions is just a part of running trade shows. Like it or not, you don’t have much choice when it comes to playing along. Knowing how to approach union labor can get confusing when you factor in labor laws and convoluted jurisdiction. Show coordinators and exhibitors are often left drowning in a sea of rules and regulations that change from state to state or even from city to city. It’s enough to make the best of us want to throw up our hands in defeat. Before you waive that white flag, I want to throw you a lifeline of information that will help rescue you when you feel out of your depth. A common misconception is that a General Service Contractor “owns” the union labor force. A GSC signs a contract with the local labor unions in each city they work in. From there, the GSC works, supervises, and manages the labor force contract, however, the union laborers are not the GSC’s employees. Rely on your GSC to put out a “call” to the city for the number of laborers that you will need. You have other priorities to deal with and adding on the extra responsibility of finding the right candidates shouldn’t be one of them. Know when overtime and double time rates go into effect. Each city had different time frames. Some unions go on overtime after working 8 hours, some go on double time at 12pm on Saturday. Understanding these time frames and building out your event deadlines accordingly will help you avoid those costly over (and double) time charges. Not all laborers are created equal. If you are working in a new city where there are multiple events at the same time, the more experienced workers might choose to work with the GSC they have a history with. More often than not, they are requested by that GSC’s labor call by name. In the event your show gets snubbed, having a GSC who can weed out an inexperienced labor force is critical. It is better to have a smaller pool of laborers that are at a higher skill level than to have many that are sub-par. A Union Steward (an elected position that you have no control over) is placed in charge of overseeing work performed by the union laborers. The steward will be closely monitoring to ensure that any work that falls under the jurisdiction of the union is only performed by union-hired labor. Any breach of a union contract will result in fines and labor disputes. It is essential that you familiarize yourself with the rules and regulations of the local union you will be working with. Understanding what tasks you and your exhibitors can perform before/during/after your show will help you avoid conflict and fees. Even tasks as simple as putting a plug in an outlet or placing reading material in the hall could be out of your jurisdiction. Treat your labor with respect (even when you disagree and are in the right). You might not have any control over how they approach things, but you do have control over how you react. Let your GSC handle any and all labor disputes you may have. They are, after all, the company that signs the contracts with them. Advise exhibitors to play nice. 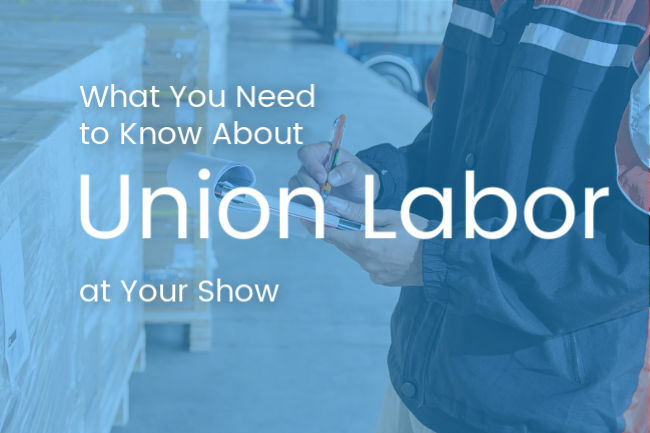 If an exhibitor creates an issue with union labor it affects everyone else’s progress when the entire show has to come to a halt until a resolution is reached. A thorough Exhibitor Services Manual should detail this information and will serve as a nice backup on site. The best case scenario is for them to channel their inner Elsa and just let it go. It’s not worth it. At the end of the day, we have to realize that there are some things we just have to go with. By collaborating with your GSC you can learn what you need to know which will enable you to make the right calls. It’s all part of embracing the events industry, even the aspects we can’t control. Events, Expo Planning, General Service Contractor, Show Management, Trade Show permalink.